Liam and Lambie were troopers throughout our journey. Travel, at least for me, always involves a lot of fretting. We fretted at Dayton airport that our half-hour flight delay would make us miss our connection in Dallas. It didn’t, although we did get to partake in the traditional ‘running-of-the-terminals’ as we rushed from one gate to the other. 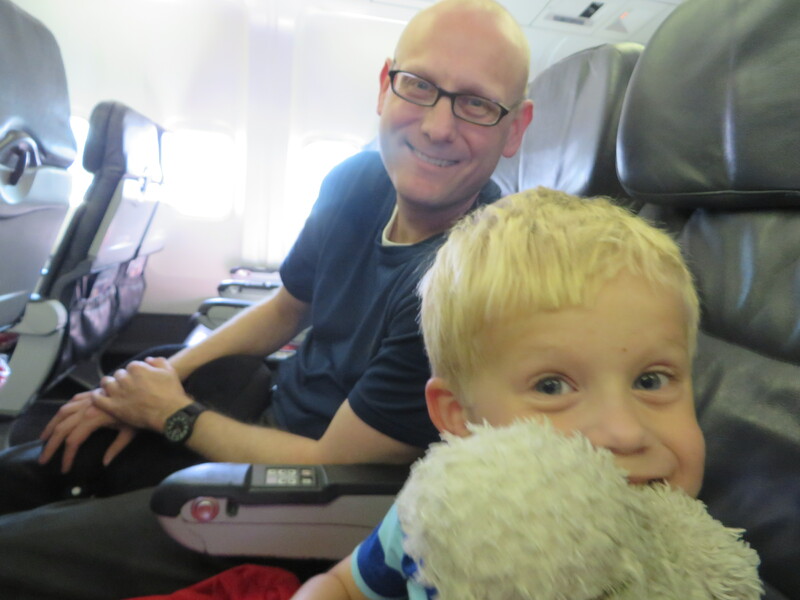 We shouldn’t have bothered: We sat on our plane for more than an hour, awaiting the repair of a cargo hold problem and then a water leak before our exasperated pilot released us, hot and sweaty, back into the airport. At least we were able to grab a quick dinner at McDonald’s before reboarding and taking to the skies three hours behind schedule. 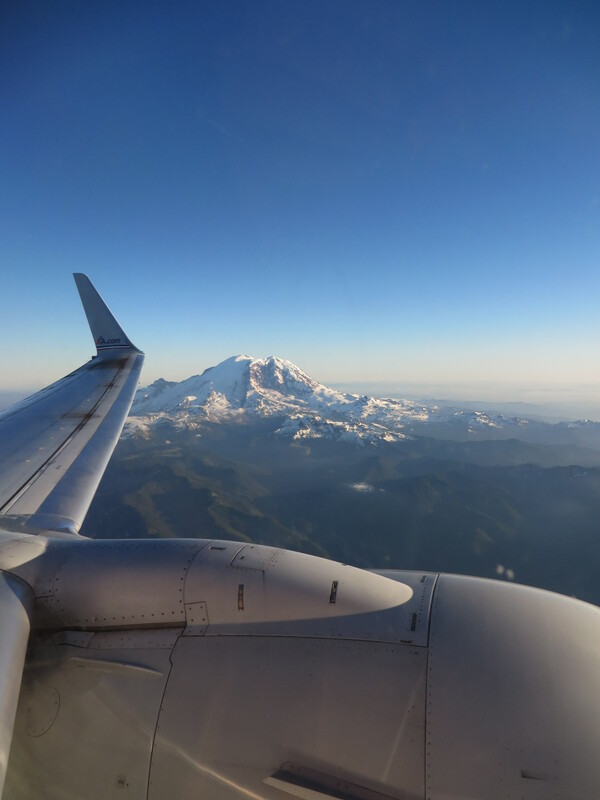 Our view approaching Seattle was amazing. In Seattle, we were greeted by Wil’s cousin, Abby, who whisked us to our hotel and treated us to a late dinner at a nearby restaurant. (Liam took advantage of our roomy booth to drift into dreamland.) We were up by 1 a.m. the next morning, arriving at our check-in point only to discover that our Air Force-chartered flight had been delayed by 24 hours, thanks to Typhoon Neoguri. We were instructed to take a cab to a new hotel in suburban Seattle. After a few more vital hours of sleep, Abby chauffeured us – again — to downtown, where we spent six hours enjoying Seattle’s waterfront and market. Through the magic of Facebook, I contacted my childhood and college friend, Anne, who drove in from Tacoma with her two children to join us for a couple of hours. After dinner with Abby at a downtown Greek restaurant, we returned to our hotel. 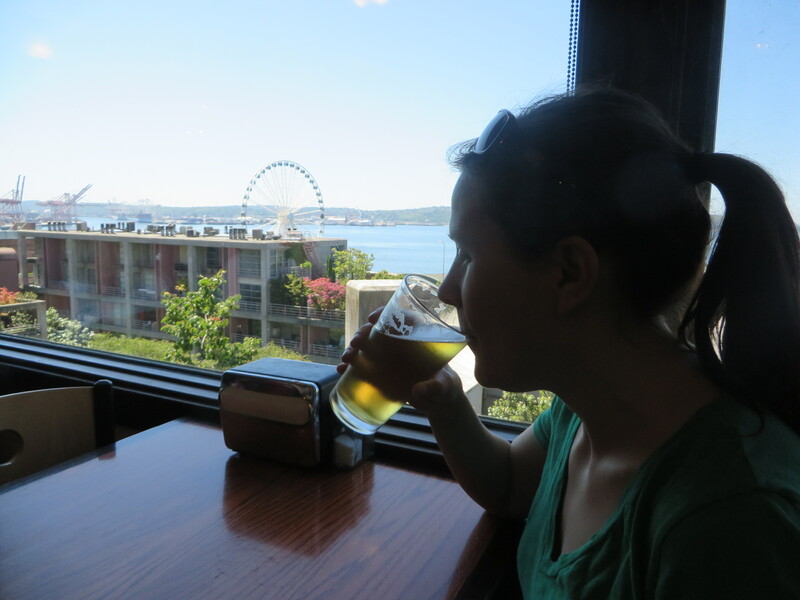 It was a terrible hardship to spend a sunny day in Seattle while we waited out the typhoon. The Air Force likes to keep us on our toes, so after rising at midnight, we were downstairs, waiting for our airport shuttle, at 1 a.m. We made it to the airport; our luggage did not. The loaded van had broken down in the hotel parking lot, so a crew of volunteers, including Wil, climbed back into the bus to retrieve all of our luggage. Our rescheduled flight was delayed by another two hours, but we did eventually get to board. Ten hours later, we landed at Yokota Air Base. And so, here we are, starting our new lives in Fussa, Tokyo, Japan. This post has grown almost as long as our journey, so I’ll leave you in suspense for now as to our subsequent adventures since disembarking on the flight line. We are staying in a hotel on base, but the brief visits I’ve had outside the gate in ‘real’ Japan have been delightful and have made me all the more optimistic that this is going to be a very good three years for our family. Now, if only we could get our tasks on base sorted: Finding a house, getting a license to drive the car we’re buying, getting Wil settled into his new job, finding a job for me, enrolling Liam in preschool, and much, much more. I’ll continue to fret through it all, but will do my best to keep my senses of adventure and humor at the ready, too. Stay posted. Thanks! I am on Twitter: @susandalzell. I’ll look for you there!